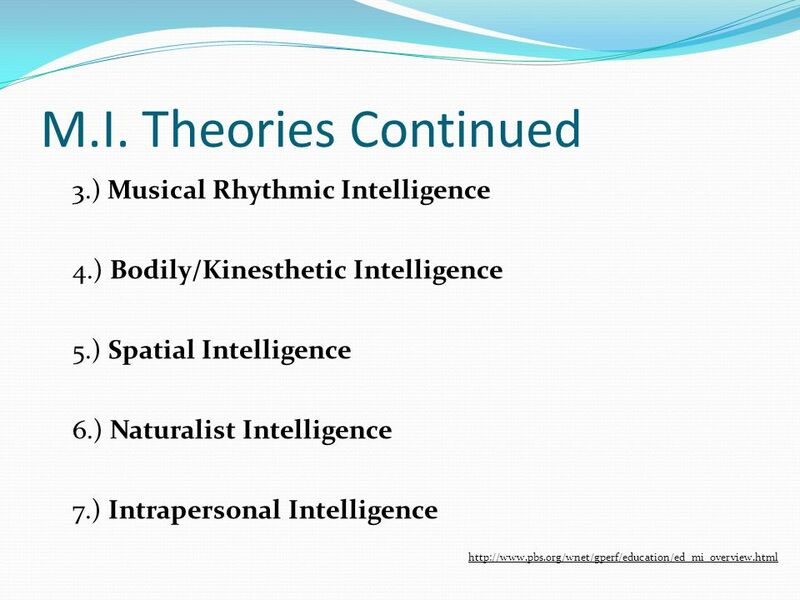 Theory of Multiple Intelligences. 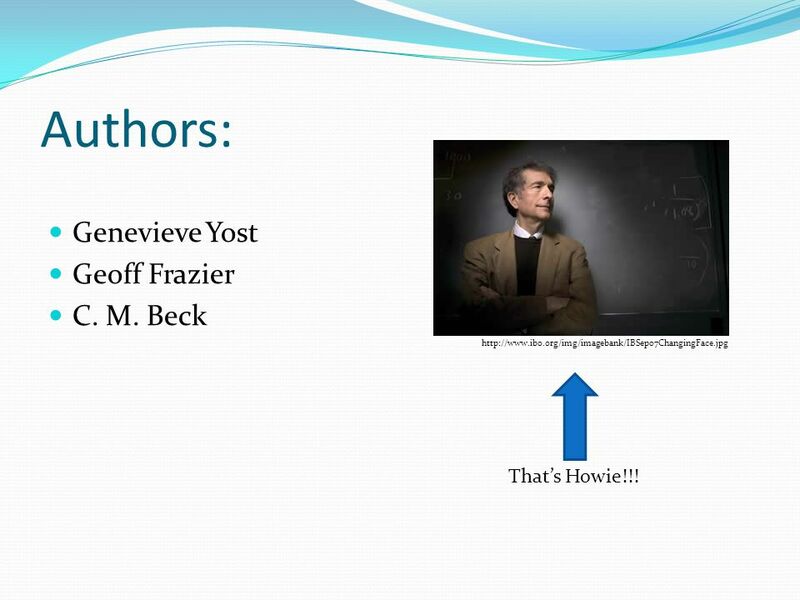 Authors: Genevieve Yost Geoff Frazier C. M. Beck That’s Howie!!! 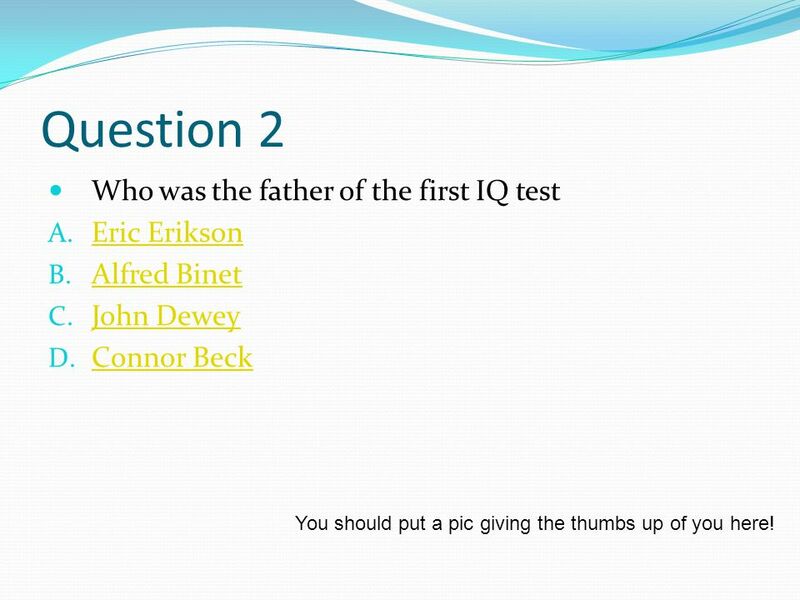 12 Question 2 Who was the father of the first IQ test A. Eric Erikson Eric Erikson B. Alfred Binet Alfred Binet C. John Dewey John Dewey D. Connor Beck Connor Beck You should put a pic giving the thumbs up of you here! 17 Great Job!!! That completes the Review Questions!!!! 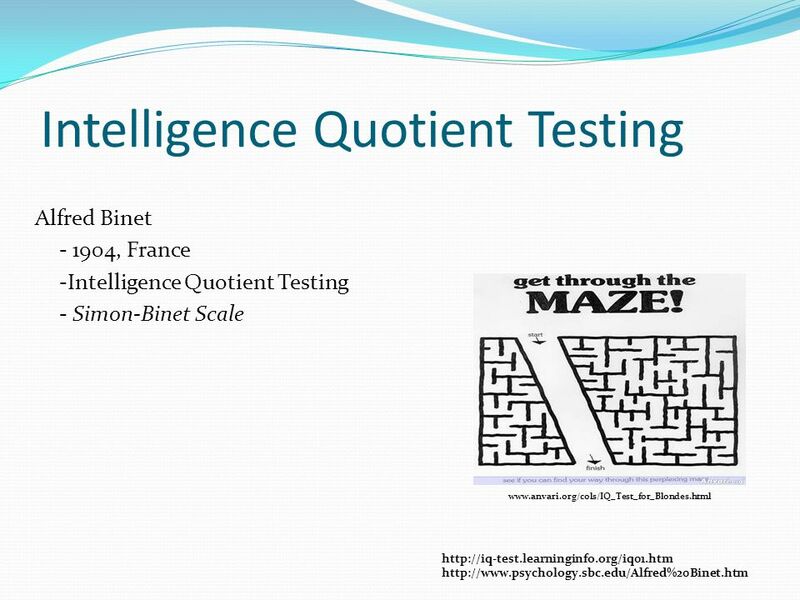 Download ppt "Theory of Multiple Intelligences. Authors: Genevieve Yost Geoff Frazier C. M. Beck That’s Howie!!!" 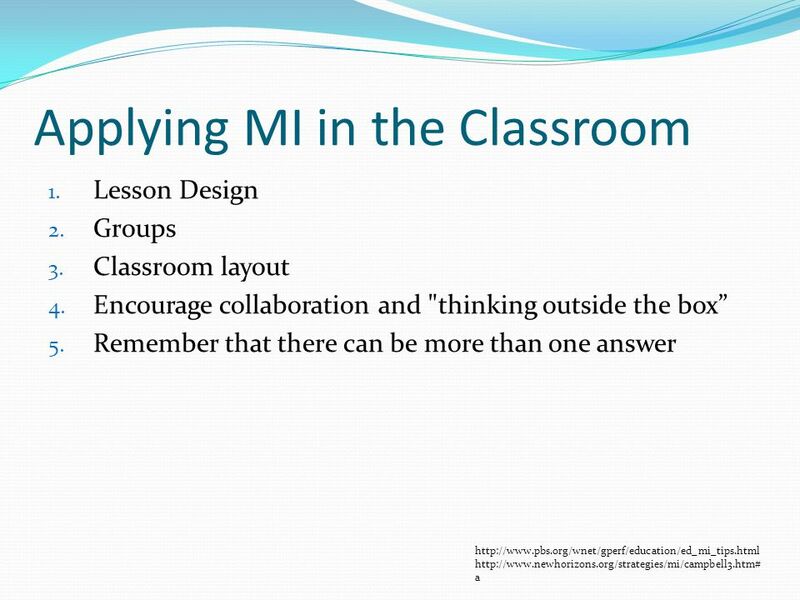 Language Barriers Using the Multiple Intelligence Theory and Instructional Technology to Break the Barriers By Carrie Pilant. Nine Multiple Intelligences. 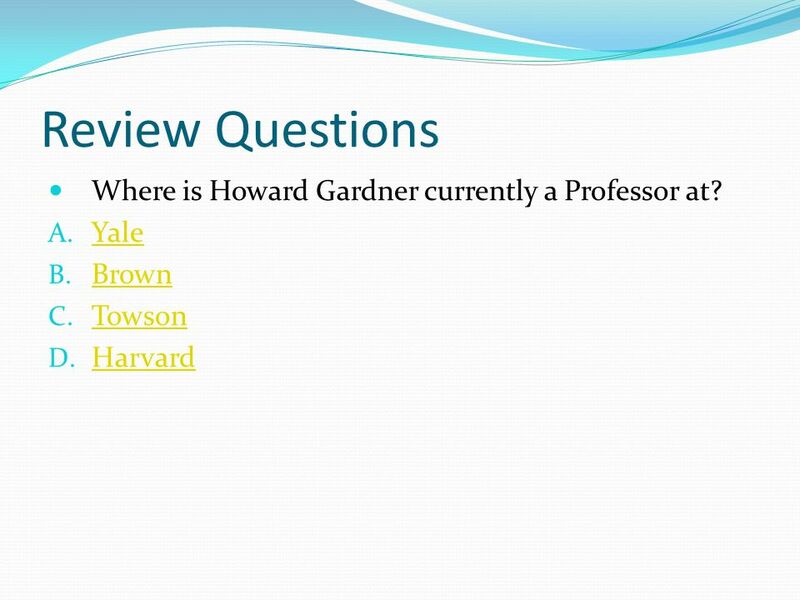 In 1983, Howard Gardner, suggested that all individuals have personal intelligence profiles that consist of combinations. Individual Differences By Suzy Cox. Different Concepts of Intelligence Single entity (Spearman’s g) Multi-faceted (Sternberg’s Triarchic Theory) Divided. E.D. HirschHoward GardenerMaxine Greene. 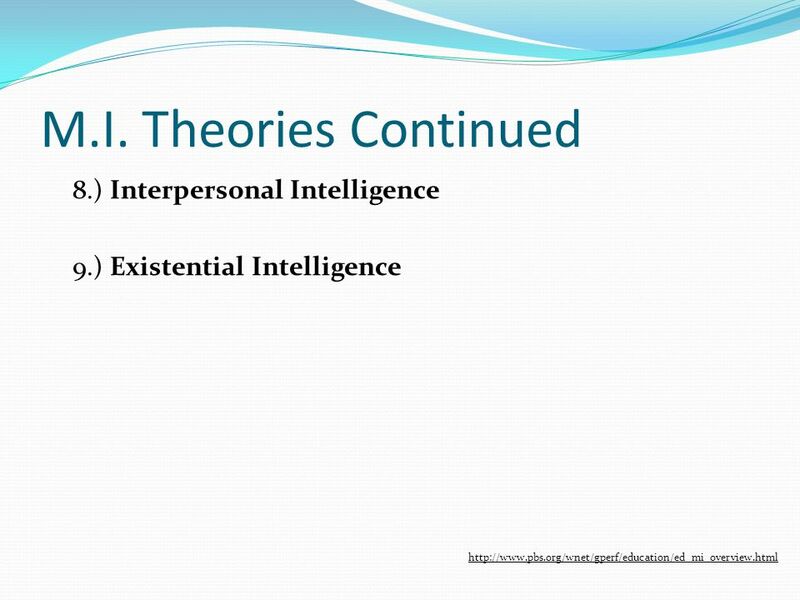 Educational Philosophies Maxine Greene – Existentialism Maxine Greene – Existentialism Believe students and teachers. 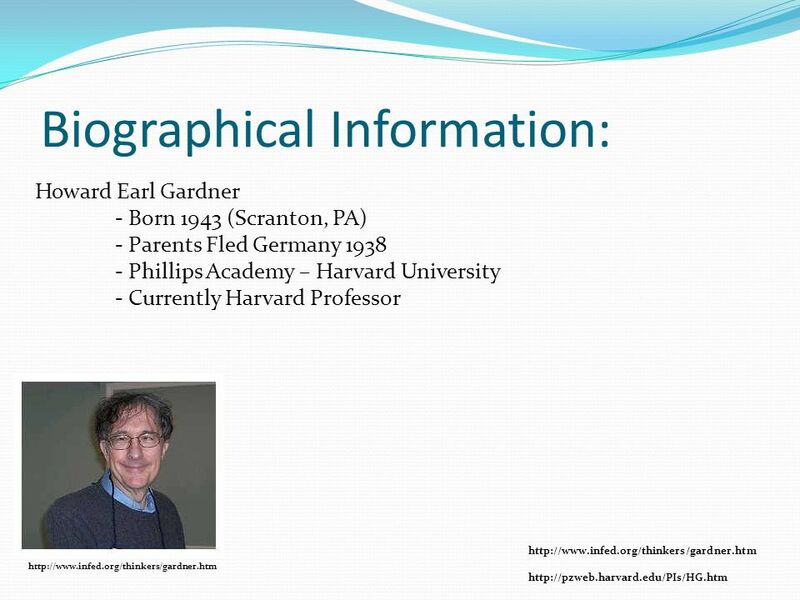 Howard Gardner Katie Henry Table of Contents Purpose Who is Howard Gardner What are “Multiple Intelligences?” Types of Multiple Intelligences. 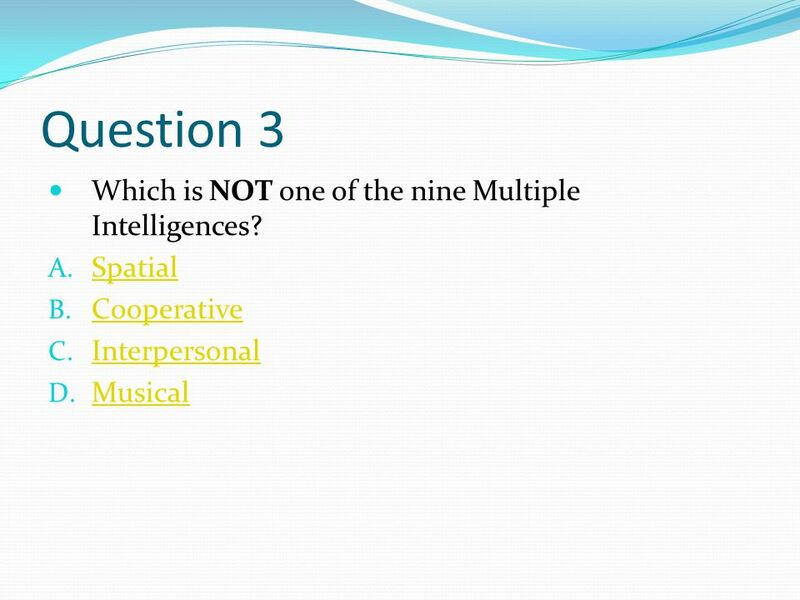 Multiple Intelligences & Knowing the Learner A.P. 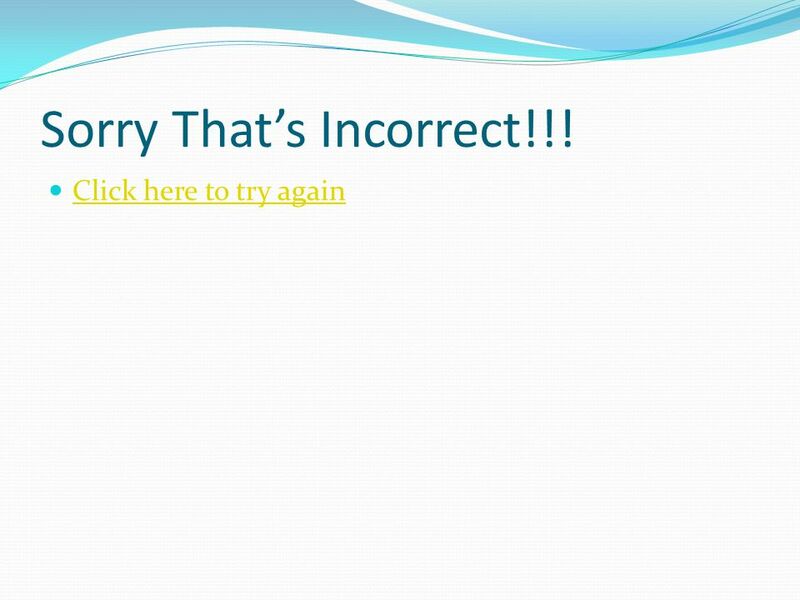 Psychology. “I want my children to understand the world, but not just because the world is fascinating and the human mind is curious. I want them to understand it. Multiple Intelligences “Nine” Different Ways of Knowing. 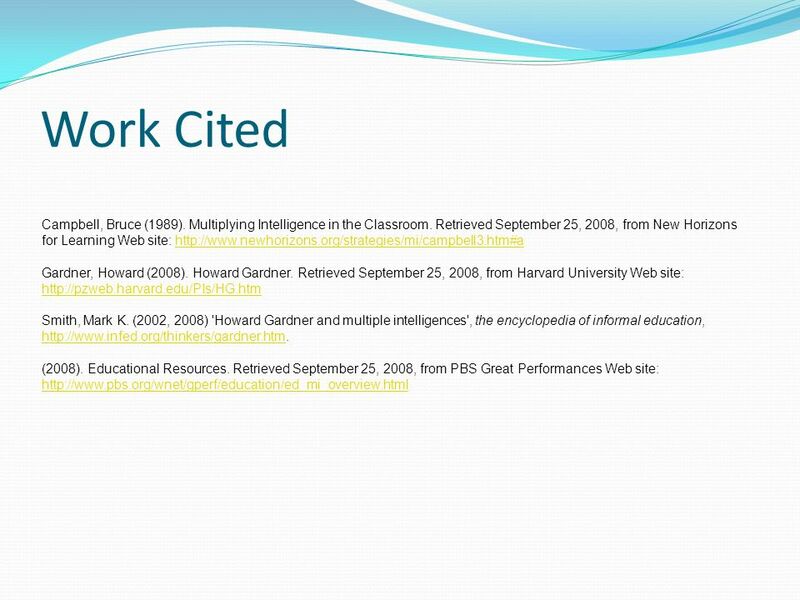 The Educational Contributions of Jean Piaget, Howard Gardner, B.F. Skinner, and Albert Bandura By Richard X. Thripp April 12, 2011 EDP 2002 Prof. John. MULTIPLE INTELLIGENCES * Verbal / linguistic learners Logical / mathematical learners Visual / spatial learners Body / kinesthetic learners Musical / rhythmic. Multiple Intelligence. Intelligence Our traditional understanding of intelligence is that our ability to learn and do things occur at the same cognitive. Howard Gardner and Multiple Intelligences Presented by: Steven Yang and Cyndi Summers Resources from the information provided by: Susan Stevens,Terri Bell,Jen. 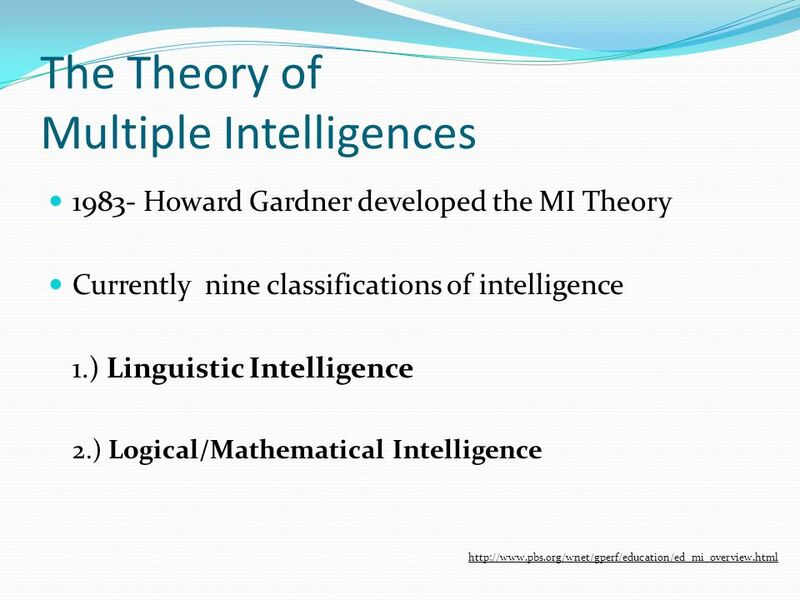 LICHTMAN, MCCLARY, SADLER, & SOPER Gardner’s Theory of Multiple Intelligences. 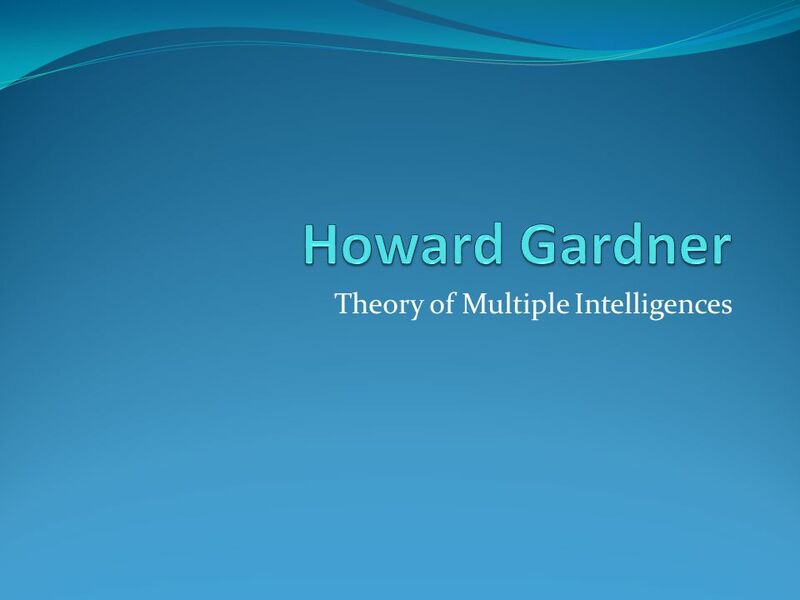 Howard Gardner Multiple Intelligences Created BY: Zachary Matlock.